← Yes, I’m opinionated. What’s your point? 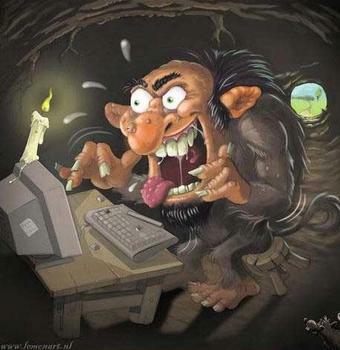 If you follow message boards or the comments on news articles you’ll notice an abundance of people commonly referred to as trolls. These people are notorious for provoking and spouting off without much discretion. The anonymity of the internet makes this a lot easier to do than, say, making ignorant or inflammatory remarks in front a group of people. I came across a good example of this the other day when reading comments in response to Canadian Member of Parliament Romeo Saganash being recently booted off a plane for being intoxicated. He quickly released a statement apologizing and admitted that he needed time off to deal with his alcoholism. Instantly people were pelting criticisms and poking holes in his statement. He explained that he had basically been going through a hairy time but that this did not excuse his behaviour. He again reached out to the public via a video apology the following day and posted a statement on his website. The commentators were not impressed. Oh but he makes such a good salary as a politician! What stress? What is he complaining about? He’s not taking responsibility. Assessments were extended to the political party of which he is a member, as if that has any relevance whatsoever. Clearly an earnest apology is not good enough. You have to be perfect in the first place. Don’t screw up – that would make you human. Most disappointing and irresponsible was the title choice for a blog posted on Yahoo! News: NDP MP Saganash blames “stressful week” for Air Canada ejection. This headline directly contradicts what Saganash was actually quoted as saying in that very same article – namely that he identified stress as a trigger, not the source of the problem – his problem being alcoholism. That’s why he’s getting treatment. My initial question was, how can grown people suffer from such a lack of logical reasoning? But actually, it’s more that their reasoning is influenced by prejudices and attitudes they’ve developed over time. It’s not that they don’t have the capacity to think clearly; they’re caught in a cycle of applying their established thinking patterns to every situation they encounter. Most people are guilty of this to varying degrees. In a way it’s a conscious choice, and yet it isn’t. Which is interesting when you consider that the people who are so eager to trash Saganash fail to recognize that his actions are also both consciously and unconsciously motivated. As the MP should take responsibility for his actions (which he has done), so too should anyone with the urge to comment. I get irritated when people have knee-jerk reactions. I think, ‘You jerk! Use your brain!’. That’s when I have to take a deep breath and realize that I’m reacting to someone reacting. Why do so many people rush to judge? We can’t blame social media because this tendency precedes the internet. And even though we may not always voice our judgments, that doesn’t mean they don’t exist in our minds or that our beliefs don’t influence our behaviour. In this sense, the internet is just showing us what used to be hidden. I often see people object that they’re not being judgmental, just critical. So let’s lay bare the distinction between the two here: being critical is assessing something with the effect of reaching a negative conclusion, whereas being judgmental is forming a negative assessment before considering the facts. It’s really no wonder that political issues are so difficult to gain consensus on. Apart from the challenge of making democratic decisions that meet diverse needs, we also have to deal with opposing views while keeping in check the close-mindedness that fosters prejudice and ignorance. It’s a miracle we get anything done (although that too is subject to debate!). Even the courts, which are supposed to be mechanisms of justice and order, fall short of this expectation in part for the same reason. As for why people are so judgmental, there are many reasons. But it has an awful lot to do with the assumptions we make about why people do what they do, who they are, the characteristics of the groups they belong to, etc. It’s worth noting that people are just as harshly critical of themselves – if not more – than they are of others. While they may not show it explicitly, I think it’s usually evident when a person shows they have a need to belittle or attack others rather than offer a reasoned response to the subject at hand. But this is a mental habit, and one that can reinforce our behaviour to the point that we don’t even realize it. So bringing awareness to this cycle is the first step to being more rational, balanced and fair, thus positively changing our behaviour. Sounds a bit like the process of addiction recovery, doesn’t it?